The anticipation of exploring the bustling Borough Market with a coffee in one hand and my husband holding my other; weaving through London’s lively morning crowd, was enough to get me up and out of my lux hotel bed early. Once our basic needs of hunger and thirst were satiated, we got back to the business of exploring London’s oldest produce and artisanal food market. Some say it dates back 1,000 years. The sprawling Borough Market, a familiar film location for Bridget Jone's Diary and other movies, can be intimidating. 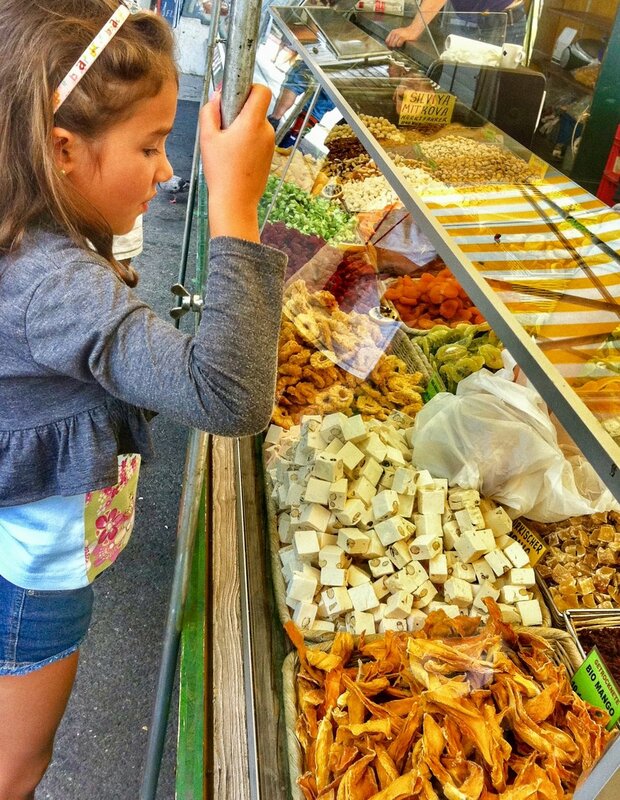 However, it is a popular example of the unforgettable experience of visiting local markets while traveling. Markets not only give you a window to observe how the locals live, but they are perfect places to shop for gifts, unexpected finds, and to sample some of the best goods that food producers in the surrounding areas have to offer. Additionally, these markets are destinations for foodies who want to try a variety of cuisine from kiosks, carts, or charming cafes. And in the case of Borough Market - with British produce sold alongside regional specialties from around the world - it mirrors London as a global city. Full market Wednesday to Saturday. (Limited market Monday and Tuesday.) Open Wednesday and Thursday, 10 a.m. to 5 p.m.; Friday, 10 a.m. to 6 p.m.; Saturday, 8 a.m. to 5 p.m.
After receiving glowing reviews from my niece who was studying abroad in this cosmopolitan Spanish capital; my sisters, Mom and I were eager to experience for ourselves the unique, urban El Mercado de San Miguel where she and her friends gathered day or night. Located in the heart of Madrid and housed in a restored 1916 Beaux-Arts building, this beautiful market of glass and steel did not disappoint. Monday, Tuesday, Wednesday, Sunday: from 10:00 a.m. to 12:00 a.m. Thursday, Friday, and Saturday: from 10:00 a.m. to 2:00 p.m. I could hear the buzz and feel the energy of the vibrant, multi-cultural Queen Victoria Market before I saw it. Festive Spanish music played by street musicians filled the warm afternoon air as dozens gathered to listen, tapping their feet and sipping beer or wine. Some cradled fresh flower bouquets like babies. Children savored candy, skipping to keep up with their parents’ brisk pace as they shopped the stalls, inspecting produce to purchase for the week. Merchants minding their stalls joked back and forth. This Melbourne institution is the largest open-air market in the Southern Hemisphere covering several city blocks. And on this Sunday, it was packed with tourists and locals alike shopping the Fall bounty. Here you can find everything from fresh Australian and exotic Asian produce and gourmet foods, to leather goods like the ubiquitous UGG boots, electronics (real and knock-offs), and souvenirs. While there are stalls showcasing a lot of junk, also there are several quality vendors. After inspecting the wares of a few jewelry merchants, I finally purchased pretty pearl earrings as gifts for my daughters. If you are hunting for treasures or gifts to take home, it is best to shop around the market to familiarize yourself with the best range of merchandise. But my favorite find that I happily stumbled upon just outside the market was “Books for Cooks”. A charming shop offering new and old books about wine and the culinary arts. The worn leather club chairs, shelves chocked full of beautiful books, and the cozy, quiet atmosphere offered an invitation to browse, relax and read that I couldn’t refuse. It has been said that this should be a stop for all food lovers visiting Melbourne. Ah, if only I had more time…! Closed Monday & Wednesday; Tuesday/Thursday 6 a.m. - 2 p.m.; Friday 6 a.m. - 5 p.m.; Saturday 6 a.m.- 3 p.m.; Sunday 9 a.m. - 4 p.m.
Books for Cooks: Opens at 9 a.m. seven days a week; 10 a.m. on Sundays. The sophisticated Ferry Plaza Farmer’s Market is a San Francisco gem, renowned as a “Top Market” destination both nationally and internationally. Not only is this market housed at the historic Ferry Building, along the Embarcadero with stunning views of the San Francisco Bay; but it is a popular gathering place for local farmers, ferry commuters, tourists, professionals, and locals like me hunting for organic produce and fresh menu ideas to “wow” my family around the dinner table. This market -- with its iconic view, friendly sellers from California’s farm and ranch lands, hand-milled soaps, wildflower honey, artisanal cheeses, and with hip restaurants and cafes surrounding it -- has a unique charm that never disappoints. Especially on a clear Spring day when the sun beckons everyone to dine out at tables under festive yellow umbrellas. My husband, three children and I have enjoyed shopping together on a Saturday morning. The children like selecting the colorful, organic produce; and the poultry and grass-fed beef that we BBQ later for dinner is exceptional. There is a sense of gratitude when you appreciate a meal where the ingredients were picked fresh from the field only the day before. The certified farmer’s market is operated by the nonprofit Center for Urban Education about Sustainable Agriculture (CUESA). The market proudly serves as a forum for people to learn about food and agriculture. Some of San Francisco’s best known chefs, such as the famed Alice Waters of Chez Panisse, can be found there on any given day. And on Saturdays, several local restaurants serve a variety of tasty bites. The Thursday market features delicious artisan street food such as tacos, sandwiches and wood-fire pizzas. And, be sure to browse inside the Ferry Building marketplace featuring merchants selling artisanal foods and goods such as Acme Bread Company, Blue Bottle Coffee, Cowgirl Creamery, Benedetta for organic skin and body care products from Sonoma, and Far West Fungi showcasing an eye-popping array of exotic and specialty mushrooms. This must see destination is easy to get to via public transportation, and yes, the historic San Francisco trolley cars stop directly in front. This lovely market by the Bay is a community hub that celebrates local culture and cuisine in the best way that San Franciscans know how. The Farmer’s Market is open three days a week: Tuesday, Thursday 10 a.m. - 2 p.m.; and Saturday 8 a.m. - 2 p.m. The Ferry Building is open Monday-Friday 10 a.m. to 7 p.m.; Saturday 8 a.m. - 6 p.m., Sunday 11 a.m. - 5 p.m. Many markets offer tasting tours, walking tours, history tours or cooking classes, so research and book tickets in advance if interested. Go early for the best stuff, easier parking and smaller crowds. Bring your own canvas bag or tote. Easier to use & better for the environment than the free plastic bags offered by most vendors. Bring cash. Some vendors prefer it, and often, smaller vendors don’t accept credit cards. Try to haggle or negotiate prices, especially if you think an item is overpriced. Getting a bargain is worth a shot!